Carwyn Jones will meet the EU's Michel Barnier and urge flexibility towards Theresa May's "vaguely credible negotiating position" on Brexit. The top Welsh Government civil servant is accused of trying to vet evidence to the Carl Sargeant inquiry. She says nothing will be blocked. The First Minister calls on the UK Energy Secretary to give Swansea Tidal Lagoon a 35 year deal similar to Hinkley Point C power station. Carwyn Jones addresses the Wales TUC for the last time, celebrating the partnership between a Welsh Labour government and the Trade Unions. 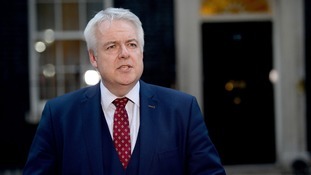 In his first interview since saying he'll quit, Carwyn Jones says it's 'hugely important' all evidence about Carl Sargeant's death is heard. The Hamilton inquiry has found that Carwyn Jones did not break the ministerial code in answers he gave to Assembly members in November. A letter signed by both Carwyn Jones and Nicola Sturgeon spells out the key points in their stand off with the UK Government over Brexit. The Welsh Government's Permanent Secretary has told AMs she can't publish her report that there was no leak about Carl Sargeant's sacking.